1. Accommodates right or left hand mousing. 2. Available in Classic or UltraThin. 3. UltraThin platform features Optimizer document holder cable management system. 4. Removable LeatheRite palm support. 5. Fits diagonal corner over 17", curved corner over 18" and 90 degree corner with adapter. Keyboard and mouse platform with rounded corners and continuous palm support. The optimizer incorporates many of the unique features found in our best selling Banana-Board keyboard platform and is included with this platform at no additional charge. Mouse area can be configured on the right or left of the platform. Split-Pad models have separate keyboard and mouse palm supports that can be removed. 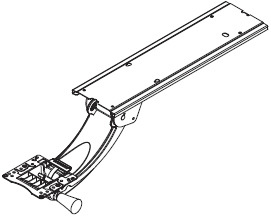 The Split-Pad Universal Platform features in-line mousing, which is appropriate for users with longer reach or those who want an ambidextrous mousing platform. Neutral wrist position is the key to comfort. All palm supports are upholstered with LeatheRite, providing the feel of soft glove leather and the durability of synthetic fiber. Its hypoallergenic, breathable micro porous structure dissipates heat in warm weather and retains it in cold weather. For superior palm support and comfort, choose our JelRite palm supports with a thermal reactive memory foam that minimizes pressure against the palm. On all platforms, our palm supports are easily removable to meet the user’s unique requirements. All Ultra-Thin platforms have the Optimizer, an integrated keyboard cord management feature, along with a built-in document holder and mouse cord retainer. Our ¼" Ultra-Thin phenolic minimizes the distance between the forearm and thigh, providing a greater range of ergonomic fit. For value driven applications, our classic 5/8" melamine platform. Classic : 5/8" thick particleboard with melamine cover. Ultra Thin : 1/4" Phenolic platform is very light and extremely tough, it doesn't break and it doesn't change color. All Ultra-Thin platforms have the Optimizer, and integrated keyboard cord management feature, along with a built-in document holder and mouse cord retainer. Ultra Thin platform features Optimizer document holder and cable management system. 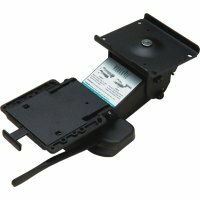 Palm support for use with existing keyboard trays and roll-out keyboard drawers. For use with roll-out keyboard drawers and other applications. 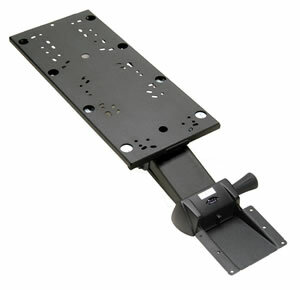 Swivel Plate: The swivel plate allows you to swivel your keyboard tray horizontally independent from the arm. 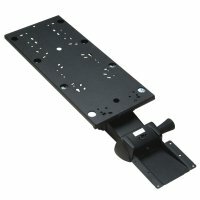 Allows keyboard and mouse platform to pivot an extra 45 degree for special mounting requirements. Mounting Spacer is required only when the edge of your desk is thicker than the rest of the worksurface. 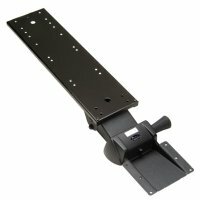 You can add spacer to make a flat surface under the desktop from front to back in order to install the Adjustable Arm. It is a pin that is inserted in the arm to prevent the tilt from going to positive. It restricts the adjustable arms going to negative tilt range from -6 to -15 degrees.